Cancer, HIV, AIDS, urinary track infection & inflammations, arthritis, rheumatism, sciatic nerve spasm, ulcers, tumors, very potent immune system booster. Studies indicate that cat's claw has the ability to protect cancer cells from maturing. Cats’ Claw is a tropical vine that grows in South America and Asia. Some refer to the plant as the "Sacred Herb". This vine gets its name from the small thorns at the base of the leaves, which looks like a cat's claw. These claws enable the vine to attach itself around trees climbing to a height up to 120 feet. The inner bark of a trunk and/or roots is considered to have valuable medicinal properties and is protected in Peru. Although scientific research has just recently begun (1959 by German scientist) to explore cat's claw, many tribes of South America have used this herb for generations. 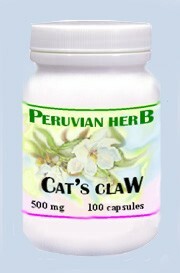 Cat's Claw - inner bark - has been used by number of tribes in Peru and throughout South America for over 2000 years. It seams Ashaninka tribe has the widest knowledge of its beneficial curative properties. They are also the source of commercial supply. Klaus Keplinger (Austrian scientist) started analysis of Cat's Claw properties in 1974. It contain valuable alkaloids. But just in the last 7 years awareness of its medicinal properties reached many around the world. Suggested Use: As dietary supplement, take 1-2 capsules daily. Uña de gato is the most sacred herb among the Ashaninkas, Campo, and some other Amazonian tribes. According to indigenous Shamans; Uña de Gato serves as a bridge, and balancer between the two worlds "physical and spiritual"; they believe in spiritual causes of ill health, they believe that firstly soul becomes ill then the body, the sacred balance/unity is broken, therefore Uña de Gato is helping to unify the two. They believe that unhealthy emotions are the cause of soul suffering. They believe that greed, and anger often cause cancer, fear causes Asthma, luck of understanding of other people point of view causes Arthritis, etc. See tea preparation, drink one glass 3 x day on empty stomach. Contraindications: Cat's Claw should not be taken during chemotherapy, and where transplants are present. 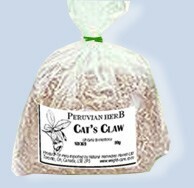 Prepare the Cat's Claw/Una de Gato tea as suggested (see Herbs from Peru on tea preparation page). 15 drops of Sangre de Grado 2 carrots grated and juiced and 30 ml of Una de Gato tea and drink in the a.m. daily until hypertension under control. Take 120 ml of Una del Gato tea daily with 5 drops of Sangre de Drago daily for 8 days then repeat x1. The Sangre de Drado helps to heal the blood vessels and the Una de Gato takes away the inflammation. NOTE: It is very wise to take FIBER BUDDY at least twice per day, to dispose toxins, clean up intestines, as well as to prevent constipation.